I made marmalade today—a rewarding but messy business that consequently involves a lot of time standing at the kitchen sink washing things up. The window by the kitchen sink looks out across the patio, where we have a ground feeder and various other things to attract birds. The cold weather seems to have brought in a new visitor to our garden. 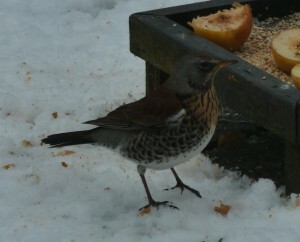 A fieldfare, or so I’m told by people who know more about birds than I do (ie Sophie). And it’s a right bully. It seems to have taken a liking to the apples that we put out for the blackbirds. It’s a fat looking thing, and you can tell why. All afternoon he’s done nothing but eat and fight off other birds. Sparrows, robins, blackbirds, starlings, none of them can get a look in. 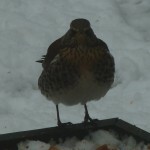 The ground feeder currently has several apples on it and large handfuls of suet and assorted seed. The fieldfare seems interested only in the apples, but he’s not letting anything else get close enough to eat the other stuff. What do we do? 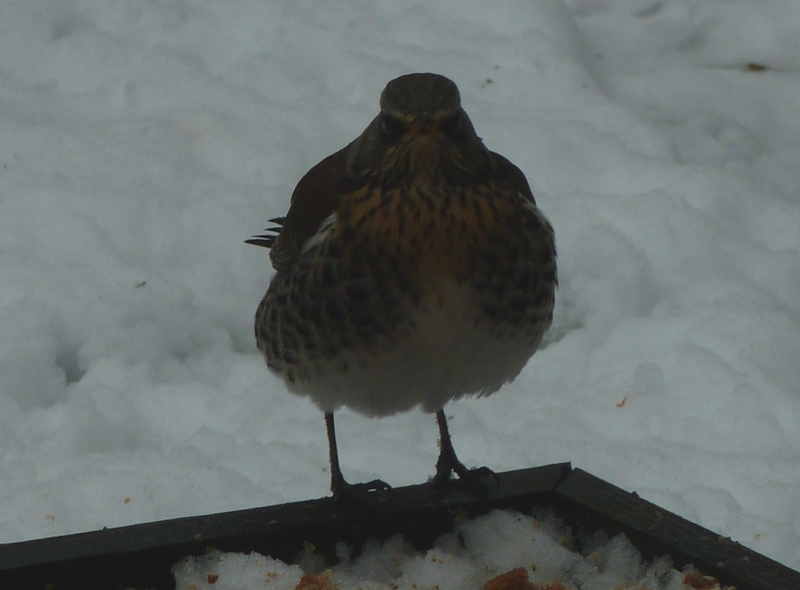 Of course, the fieldfare is welcome to come and eat, but it seems determined to stop any of the regular visitors from eating at just the time when they most need to. Should we let nature take it’s course, or should we intervene somehow?